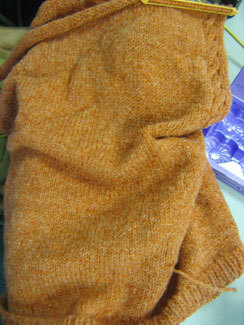 And Silvia brought in a wonderful sweater she's working on in the loveliest pale orange yarn. Her knits are always so simple and classy. The only detail here is the small cable running along the armhole openings. Very nice. 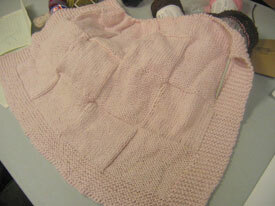 Siliva is working on a baby blanket in the loveliest pink. 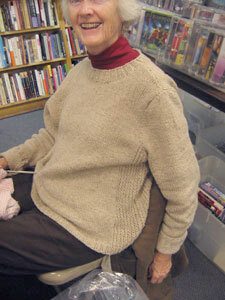 And here's Silvia in her latest and greatest creation, a Jo Sharp sweater in her DK Tweed. I love the twisted stitch detail on the sides! 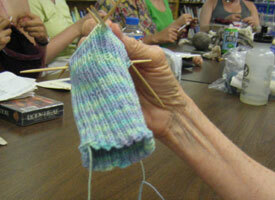 Silvia is making the loveliest sock with Lorna's Laces sock yarn. So pretty. 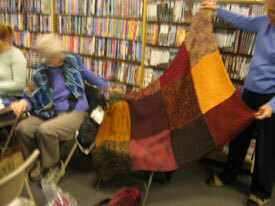 Silvia shows off her gorgeous Manos afghan. Each square is unique in a different colorway and stitch pattern. The pictures don't quite capture the richness of all the colors, but trust me they're magnificent! 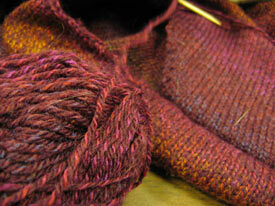 Silvia is working on a lovely Jo Sharp child's sweater. 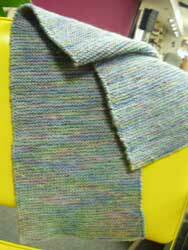 The yarn looks like Grignasco Top Print and has the most wonderful colors in subtle stripes. 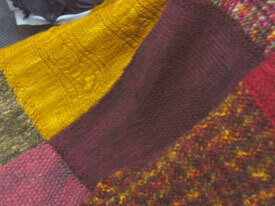 This beautiful manos afghan is being made by Silvia. She's on her second of four panels. 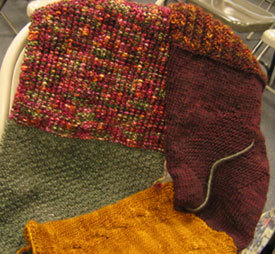 Silvia's beautiful scarf in Mountain Colors. Looks like Monet's Waterlilies, doesn't it?